Excuse the announcement but, as there were some kind requests for one, I've added an email subscription feature to this site. You can click "subscribe" up there on the top bar, or right here. I've got to begin with thanks. That last post, about my grandmother, was, well, I don't know what to say. It was a big one for me. To write, and to share. But oh, you guys are amazing. I could not have dreamed of a more comforting, hopeful, or supportive response, nor could I ask to be part of a better community. I cannot get over the generosity of your kindness. I was honoured to read your thoughts and anecdotes and I am working my way through the thread, sending personal replies, rather than commenting here. Until you hear from me directly, please take this as a thank you. Dessert is my preferred way of expressing gratitude lately. I hope there's no objection. On this end, school's started. Not for just one lad around here, but, for the first time, two are off each day. There are bookbags leaning by the door, and snacks to pack, and matching drink bottles to fill. I spent one afternoon with a sharpie in hand, dutifully labelling the insides of shoes, and coats, and hats; in nice, clear, printing I wrote the names of their respective owners, the names of my children, staking small claims of childhood property in the big, new world they're now a part of. There's been a lot of firsts. For them, and for my husband and me. There's been a few tears, even. Summer left overnight. There's wasn't the gentle receeding, the diffusion of one season to the next. With Labor Day, a switch was flipped, the needs of the next day changed, and we were expected to fall in line. There's been some stumbles, but we're keeping up. 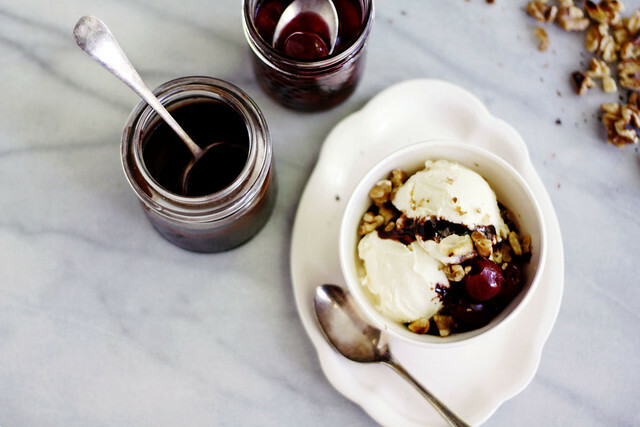 And for the times when we don't, we've had chocolate sauce. With the first day of long pants and long sleeves, there was a call for hot chocolate, and I used this sauce as its base. One morning (don't judge!) where there was unexpected sun, so there were coconut-chocolate milkshakes for two. And earlier today there was a 4-year-old-sized ice cream cone, topped with a spoonful of chocolate, apropos of nothing more than the fact we'd made it through Monday. Sometimes the smallest of victories call for the most fanfare. 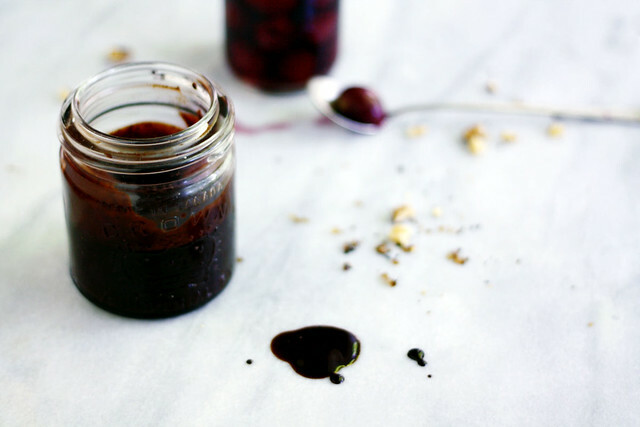 Chocolate sauce is something seperate from hot fudge; it is thinner, sharper, and less sweet. Chocolate sauce doesn't have its dense chew either. It coats a spoon, but runs off quick enough. It can be used cold, or at room temperture, or gently warmed. It is what I like to use for this cake, or ripple into an ice cream like this one, and if it's usefulness wasn't enough, this chocolate sauce takes less than five minutes to make. Seriously. It's the kind of go-to sweet something to keep stowed in the fridge door for emergency situations. Or Mondays. This recipe began with one from David Lebovitz; I've halved the overall quantites, added some ingredients and fiddled some others, because I'm evidently a difficult pupil. I can't help it, I like the character coffee brings to chocolate, and so can't seem have one without the other — in this sauce especially. In a medium saucepan, whisk together the water, sugar, corn syrup, cocoa powder, instant coffee granules and salt. Bring to a boil over medium heat. Once it's come to the simmer, remove from the heat and stir in the chocolate until melted. Set aside at room temperature for a few hours, it will thicken as it cools. Store, covered in the refrigerator, for up to 10 days.